LAKE SUCCESS, N.Y., February 17, 2009 – Canon U.S.A., Inc., a leader in digital imaging and optics, today introduced two new Tilt-Shift lenses, the TS-E 24mm f/3.5L II and the TS-E 17mm f/4L. These two new L series lenses expand the Company's extensive lens line-up of TS-E lenses giving photographers creative control over perspective and depth of field in their images. Both the TS-E 24mm f/3.5L II and the TS-E 17mm f/4L are specialty lenses ideal for landscape and architectural photography and are compatible with all Canon EOS system single lens reflex cameras(1). The TS-E 24mm f/3.5L II, a replacement for Canon's TS-E 24mm f/3.5L introduced in 1991, has significantly improved operability with low distortion when photographing buildings, consistent image quality throughout the image and reduced chromatic aberration when shooting at ultra-wide angles. The TS-E 17mm f/4L is the world's shortest focal length Tilt-Shift lens with full-frame 35mm coverage. "These two new lenses are Canon's answer to photographers who have requested wider angle Tilt-Shift lenses, with the new TS-E 24mm for wide angles and the all new TS-E 17mm for ultra-wide angles. We continually seek to expand our optics portfolio to meet the demands of our photographers to ensure that they have the best tools available to capture some of the most stunning images on the planet," stated Yuichi Ishizuka, senior vice president and general manager, Consumer Imaging Group, Canon U.S.A. The high-precision glass molded aspherical and UD glass lens elements and accurate aspherical GMo along with a large diameter in new TS-E lenses deliver outstanding image quality, high resolution and super-low distortion to all edges of the image. Each lens incorporates a new type of anti-reflection coating, Canon's SubWavelength structure Coating (SWC) that continuously changes the refractive index on the lens surface via wedge-shaped structures more minute than wavelength of visible light. Canon's SWC helps minimize flare and ghosting caused by bright light from large angles of incidence. The new TS-E lenses are the 2nd and 3rd Canon EF series lenses with SWC, following the EF 24mm f/1.4L II USM that was introduced in 2008. 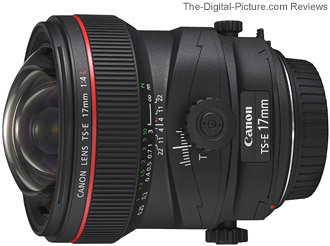 The TS-E 24mm f/3.5L II is expected to ship in May for an estimated retail price of $2,199.00*. The TS-E 17mm f/4L is expected to ship in May for an estimated retail price of $2,499.00*. Canon U.S.A., Inc., is a leading provider of consumer, business-to-business, and industrial digital imaging solutions. Its parent company, Canon Inc. (NYSE:CAJ), a top patent holder of technology, ranked third overall in the U.S. in 2008†, with global revenues of US $45 billion, is listed as number seven in the computer industry on Fortune Magazine's World's Most Admired Companies 2008 list, and is on the 2008 BusinessWeek list of "Top 100 Brands." At Canon, we care because caring is essential to living together in harmony. Founded upon a corporate philosophy of Kyosei – "all people, regardless of race, religion or culture, harmoniously living and working together into the future" – Canon U.S.A. supports a number of social, youth, educational and other programs, including environmental and recycling initiatives. Additional information about these programs can be found at www.usa.canon.com/kyosei. * Prices are estimated retail prices. Actual selling prices are set by dealers and may vary. (1) To prevent the knobs on TS-E lenses from coming into contact with the camera during tilt/shift/revolving/TS revolving movements, the use of EOS-1 class or EOS 5D/5D Mark II cameras is recommended.